Choirs and congregations alike will treasure this dynamic arrangement of the beloved traditional hymn, Come, Christians, Join to Sing. Solid choral writing and dynamic accompaniments are hallmarks of Jay's writing, and they combine here with opt. solo trumpet obbligato (part included) or separate brass parts. Opt. congregational singing is included on verses 1 and 3. Great for the entire church year, especially Ascension, Christ the King, and "Rally Sunday" (the first Sunday after Labor Day)! 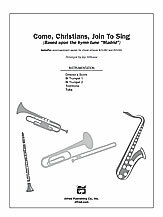 InstruPax includes parts for 2 trumpets, trombone, tuba and director's score.